I would like to thank The Jenny Mac Book Blog for this first-ever nomination for Mirth-Marks — Chelsea has several of these feathers in her cap and it’s an honor to be nominated by her! 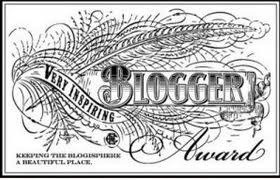 Congrats to these nominees … and thanks again, Chelsea of The Jenny Mac Book Blog. 365 Days of Divesting— Now on Day #52 of living more, with less…one day at a time! Alchemy — My opinion…you never know what else you might get.